Welcome to our ongoing Talking Bull feature in which “Uncle Rob” attempts to answer some queries and sort out some problems in football, these are usually, but not exclusively, in and around Edgar Street. I think I may have shot myself in the foot with my choice of a gun tattoo down the side of my shin – what do you think? It’s all very well and good bragging about your sharp-shooting in club colours, but you clearly forgot to pack any ammunition for the World Cup in Russia. However, we enjoyed your sinking of the Spanish Armada, so keep smiling. I’ve come up with a clever plan to stop people making jokes like “he’s shot himself in the foot” with my own gun tattoo down the side of my shin; mine faces up, not down! Clever, eh? – what do you think? So, you’re saying it’s pointing at your head? Yes, very clever indeed. No, I can’t imagine how anyone could possibly make jokes about that. 1. Don’t pick up the phone. You know he’s only calling ‘cos he’s drunk & alone. 2. Don’t let him in. You’ll have to kick him out again. 3. Don’t be his friend. You know you’re gonna wake up in his bed in the morning. And, if you’re under him, you ain’t getting over him. Those “Pre-Match Meal” deals in the Hereford Suite look a bit scrumptious, but are all dietary requirements catered for? Sorry to trouble you by asking, you look like you’ve probably got enough on your plate as it is! Ironically, in a county famed for beef, the veggie option has been popular here for many years, our well-seasoned “Rye and Greens”. Veggie sales will also have been boosted by diners’ recent uncertainties over the precise contents of a “Horsell Steak-Pie”. But, I’m sad to inform fans that our first “halal-certified” meal, sourced direct from the Middle East – “Jordan Lamb” – is currently off the menu, after a number of supply problems. It’s sad, so sad. It’s a sad sad situation and it’s getting more and more absurd. It’s sad, so sad. Why can’t we talk it over? Sorry seems to be the hardest word. Come on now – I know it’s you and I have to say I’m rather disappointed. You of all people, pretending to be Mr/Mrs/Ms Withheld, and elbowing your way in on my working relationship with a vulnerable person who clearly needs and values my empathy and advice. Now, if you still feel you need to apologise, this really isn’t the right forum for it. Let’s just say you were helping out somewhere, on a voluntary basis. How would you go about getting rid of one of the other chaps there who you’d taken a particular dislike to? Asking for a friend. That “Bad Attitude” of yours keeps getting you into trouble. You’ll realise one day that you can’t be so high and mighty. When the dizzying heights overwhelm you, you need your A team to stay switched on and pull you through. Keep your feet on the ground, and remember; don’t abuse anyone’s trust. 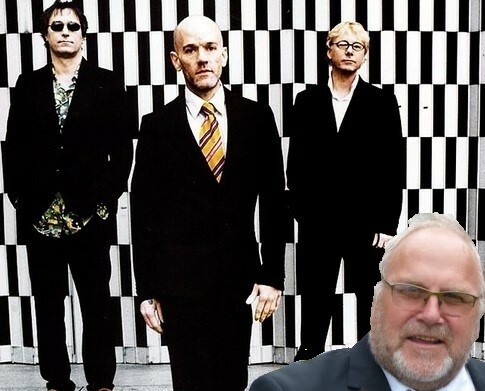 As a long-standing fan of R.E.M., I was as disappointed as anyone by news of the band’s split-up in 2011. What I would like to know is how on earth did your football club persuade their former lead-singer Michael Stipe to take over as first-team manager? It surprised us all at ES, especially given the popularity of our former coach, country music Hall of Famer, Kenny Rogers. You may be interested in this photograph I once had taken with the guys in R.E.M. That’s me in the corner.